Vladdir, King of the underground Temlochti State, is cast out into the Desert when his kingdom is invaded by Aragoths — strange soldiers controlled by the Sorcerer Ilet, who has made no demands and is destroying everything without reason. On the brink of losing everything, Vladdir gives in to a curse that fills him with cannibalistic desires, and gains him access to the capricious, dark magic of the Desert. With his new powers, he overwhelms the nearly indestructible Aragoths — but finds that Ilet was not the Aragoth commander at all. His true enemy is the mysterious Desert Priest, who taps into Vladdir’s curse to ensure the King will never know peace, and to make him pay for the near obliteration of the Aragoths with all he holds dear. There is only one way out — to set free the Pure Continuance of the King who roamed the Desert before him. 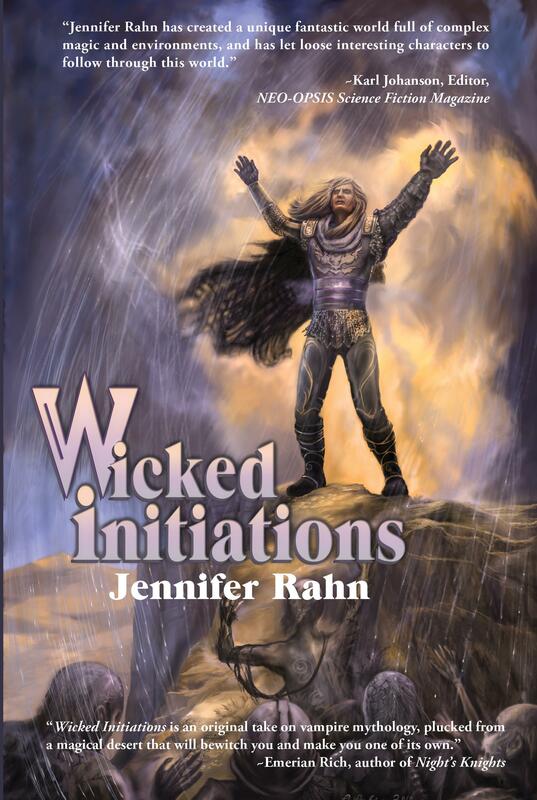 "Jennifer Rahn has created a unique fantastic world full of complex magic and environments, and has let loose interesting characters to follow through this world." "Smart and well-written, Wicked Initiations, is deliciously dark and totally captivating. I was hooked. A daring and vibrant new voice on the female literary frontier, Jennifer Rahn demonstrates a solid talent for conjuring up fully realized characters and detailed worlds. She’s a writer to watch." "Wicked Initiations is an original take on vampire mythology, plucked from a magical desert that will bewitch you and make you one of its own."